Transfer WhatsApp chats between iOS & iOS, Android & Android, and Android & iOS. Backup or export iOS/Android WhatsApp messages to computers. Backup your LINE/Viber/Kik/Wechat chat history with just one click. 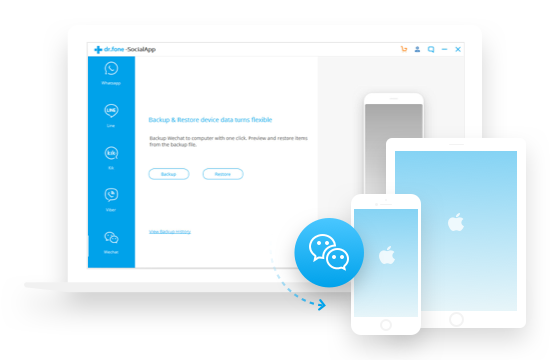 Preview the backup content and restore only the data you want. When you get a new device, no matter it is iPhone or Android phone, and transfer your WhatsApp account to it, your old conversations don't automatically come along with your account. Thankfully, WhatsApp transfer is made simple with dr.fone now. It can help you transfer WhatsApp messages from iPhone/iPad/Android to iPhone/iPad/Android directly, and restore WhatsApp backup to new iPhone or Android. 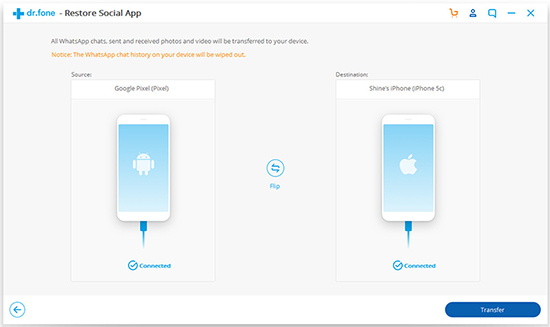 It enables us to transfer WhatsApp chat history, as well as WhatsApp attachments from iPhone/iPad/Android to iPhone/iPad/Android devices. Whether it is an Android or iPhone, you can backup WhatsApp chats and attachments easily to computer, restore WhatsApp backup whenever you want. No matter you're using the latest iPhone XS, iPad Pro, or the old iPhone 4, iPad 1, this backup software is fully compatible with all models of iPhone, iPad and iPod touch. 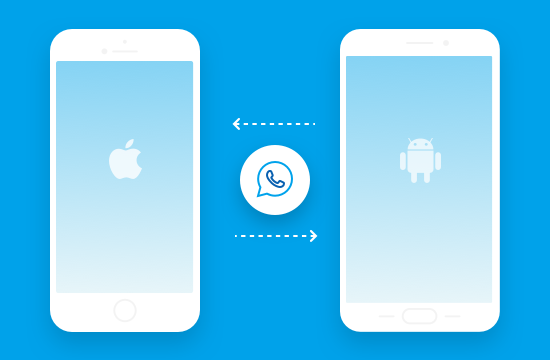 Be they Android or iOS devices, you can easily transfer WhatsApp chats from Android to Android, Android to iOS, iOS to iOS, and iOS to Android. Although WhatsApp itself supports restoration of Google Drive and local backup to a new Android device. The 2 steps of backing up WhatsApp and then restoring are time-consuming for most users. In addition, there are limited space and validation period for WhatsApp storage on Google Drive. How about using a PC tool to transfer WhatsApp from Android to Android directly? Start up dr.fone from your computer, and select the "Restore Social App" option. Connect your Android devices to the computer. Select "WhatsApp" and click on "Transfer WhatsApp messages". In the new interface, click "Transfer". All WhatsApp chats will be on the new Android in a while. The WhatsApp chat app is popular not only on Android, but also on iPhone. How to get WhatsApp chat history to new iPhone from old Android? The natural incompatibility between the two systems used to make WhatsApp chat transfer so hard. But now, we've got dr.fone - Restore social app, which supports smooth WhatsApp transfer from Android to iPhone. Here is how to do it. On your PC, install dr.fone and select "Restore Social App" from the main menu. Use the right cables to connect your Android and iOS to the PC. Select "WhatsApp" from the left bar, and then choose "Transfer WhatsApp messages". Confirm the positions of the source and destination devices, and click "Transfer". Most people transfer WhatsApp chats between iPhones by iCloud or iTunes backup and restoring. iCloud has only 5 GB free space and cannot backup large volume of WhatsApp chats or media, and iTunes restores all the other unwanted data together with WhatsApp chats. We are calling for a better WhatsApp transfer solution. Let's now try dr.fone - Restore Social App. First of all, get the dr.fone tool downloaded on your computer. Start dr.fone, connect both iPhones to the computer, and select "Restore Social App". Upon the startup, select "WhatsApp" > "Transfer WhatsApp messages". In the screen that displays the iPhones, click "Transfer". Attracted by new Android features and want to switch from iPhone to Android? WhatsApp should not be a blocking factor. Worrying about how to transfer old WhatsApp messages from iPhone to Android? With dr.fone - Restore Social App, you can not only directly transfer WhatsApp chats from iPhone to Android, but also restore WhatsApp backup from iTunes to Android. Download, install, and open up the dr.fone tool. 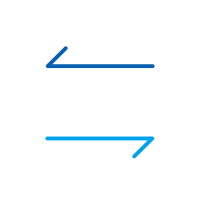 Select "Restore Social App" among other functions, and connect both devices to PC. Click on "WhatsApp" from the left bar and choose "Transfer WhatsApp messages". If you have WhatsApp chats backed up in iTunes, you can also choose "Restore WhatsApp messages to Android device". It makes WhatsApp backup really easy for iOS users. 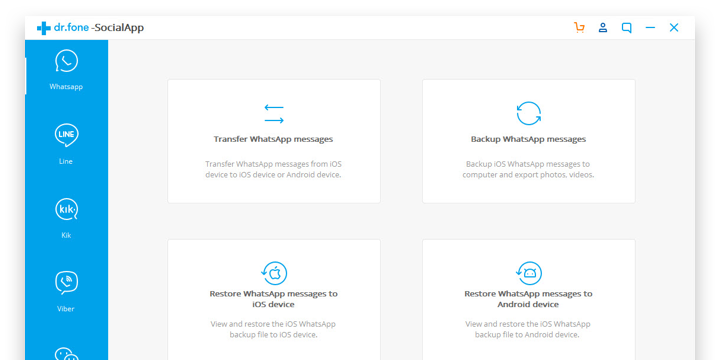 Afterwards, you can preview the WhatsApp backup content and restore the backup to the original device or a new iPhone/iPad/Android device. Launch dr.fone and connect your iPhone. Go to Restore Social App module and select Backup WhatsApp Messages. All WhatsApp messages and attachments will be backed up to computer. 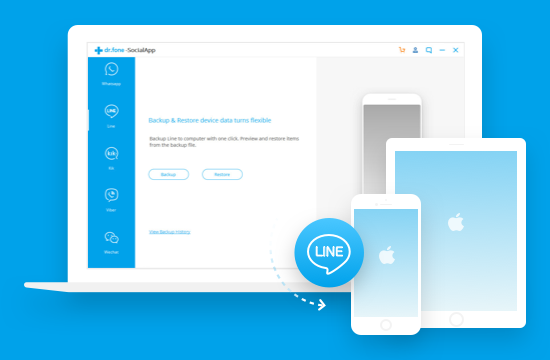 dr.fone enables you to backup all your LINE chat history, including personal chats and group chats; text, voice and video chat history; images and stickers, etc. You can preview the LINE backup file and restore LINE chat history or even selectively export any item to computer. Wechat provides great convenience for communications, and dr.fone makes it more convenient to protect your Wechat conversations. You can backup all Wechat messages and attachments to computer and restore them to any iPhone/iPad later. Just connect your iPhone or iPad and click to start the process. The rest is automatic. Afterwards, you will be able to preview your Viber backup content. All Viber messages, attachments and call history are backed up. Later, you can export your Viber chats as HTML files on your computer or restore them to any iPhone/iPad. dr.fone helps you read all your Kik chats at any time with no limit. You can backup your Kik chat history everyday if you want. Before restoring, you can preview the backup file selectively and restore the backup to iOS device. Everyone can do it, no sweat. dr.fone toolkit Help me successfully transferred WhatsApp data from my old Android Phone to my new iPhone 8.